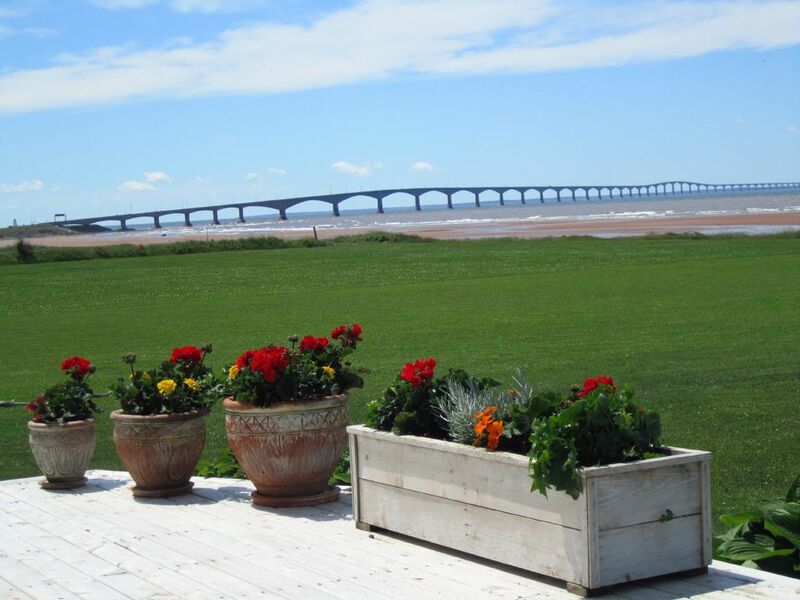 Enjoy breathtaking sunsets and a view of the spectacular Confederation Bridge from the large well appointed deck. This beautiful cottage has been given a four star rating from Canada Select and is fully furnished with all the creature comforts of home. Our cottage is situated on 2 acres of land,but centrally located to Charlottetown,and Cavendish beach area,home of Anne of Green Gables. The private beach is perfect for young and old alike, with calm waters(the warmest north of Virginia) that are excellent for swimming, kayaking and water-sports and low tides which are perfect for long walks and sandcastle building on the expanse of sandbars. The bright open-concept interior is perfect for entertaining or relaxing; complete with sun-room dining area. - fully equipped kitchen with many extras included. Full laundry facilities. - Satellite TV with PVR, DVD player, telephone, WiFi internet, book exchange. - Stainless steel propane BBQ with side burner on deck ready to grill and steam local seafood available just minutes away. - Very child friendly atmosphere with a selection of toys and activities. A beautiful island that should be cherished! Great location with a spectacular view of Confederation Bridge! Our accommodations were lovely! Spotless, with every necessity! Easy driving to all sightseeing. Highly recommend a visit to PEI !! The cottage was perfect, it was so clean and nicely decorated and had all the comforts of home. The cottage is immaculate and has everything you need. Many out-tide ocean walks to be had. Cannot imagine staying anywhere else. Would recommend to anybody and everybody !!!! Thanks for the great review. It's always a pleasure having you stay at our cottage. Hope to see you again next year. We have stayed at this cottage many times with our two kids and it's absolutely perfect. The location and views are stunning, there's plenty of space to play, easy access to the beach and all the comforts of home. It truly feels like a home away from home. We had a great time staying at the cottage. The location on the island is excellent and the view is outstanding. The cottage was clean and well kept. We would love to visit again! Open May 26 to October 31. Rates based on occupancy of 4 people. Additional $100 per person per week. $500 deposit required at time of booking. Balance due 30 days prior to arrival. PLEASE NOTE. Rates on HomeAway.com and VRBO.com. are shown in U.S. Dollars.Rates on HomeAway.ca are shown in Canadian Dollars.